Since the rise in fuel costs, more and more people are looking to reduce their heating bills. 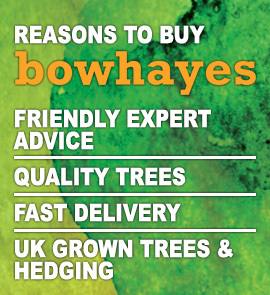 We have been inundated with calls asking about growing our willow and poplar trees for logs i.e. 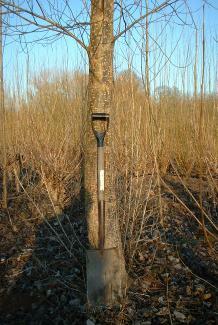 short rotation coppice (SRC). 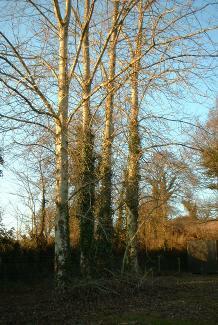 The poplar would be best left to grow as a tree, but can also be used for wood fuel. They are ideal for planting as borders (screens) and along field margins at 1 metre intervals. They can then be thinned at a later date for logs. 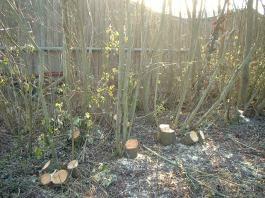 Willow would be the ideal contender as it coppices well, depending on your requirements, as to the size of the wood i.e. wood chips for boiler or logs for log burner. 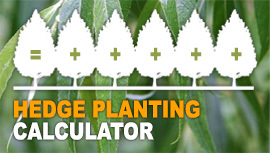 Normally your first harvest would be 4-6 years from planting, with the trunks between 3"- 4" diameter. Harvesting thereafter every 3-4 years depending on size. For small scale planting (1-2 acres) the ground would ideally need to be sprayed off with Roundup (Glyphosate) in late summer and then ploughed, left and worked down ready for planting. It would be best to mark out the field similar to the diagram below, or you may have your own ideas. If you are using a grass field, you may wish to spray off just the planting strips and then simply mow the grass between the harvesting gap. The easiest way for planting the setts is to pull a slit through the ground approx. 12" deep with a subsoiler or other tool. The setts can then be pushed in the slit, at 3ft (1.00m) spacings and firmed in by foot. Or using a posthole borer, holes can be bored out (again 12" deep) at the 3ft (1.00m spacings). The holes can then be lightly filled in and the setts pushed in. If you are feeling energetic, they can be planted by making a split with a spade. Your choice of size will depend on how you intend to manage your site. If you intend to rabbit fence the area and keep them completely weed free for the first year, then the 1ft setts are adequate. Years of experience have shown us that the two foot and larger setts are far more reliable with a better success rate. These can then be protected with a transparent spiral rabbit guard. A two foot sett will require a cane to support the guard, but a 3ft or larger sett will support the rabbit guard by itself. 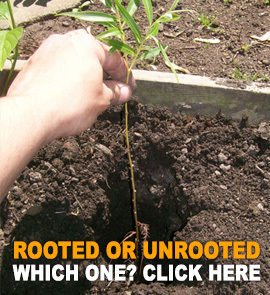 Good weed control will maximise growth in the first few seasons, after which you willows will shade out the weeds. Hoeing or careful spraying with Glyphosate (Roundup) while the weeds are still small can be effective. 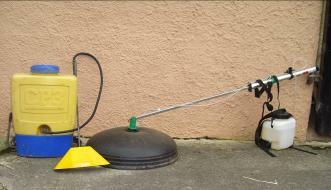 Conventional knapsack sprayer with shield on left and on right atomised sprayer with 2ft shield. 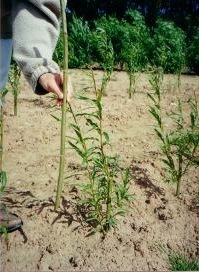 Willow and Poplar are very susceptible to Roundup (Glysophate), so be careful when applying your spray. DO NOT ALLOW GLYPHOSATE TO CONTACT THE LEAVES OR GREEN BARK AS IT WILL DAMAGE YOUR SETTS. As with all crops, the better the land, the higher the yield. 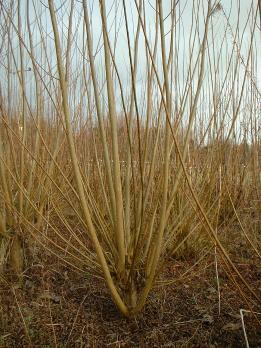 Willow will grow on most soil and will respond well to small amounts of fertiliser. Ideally this should be applied little and often, particularly in the first season, as the setts are putting on their roots, they are vulnerable to over-application. Growmore or an agricultural compound fertiliser (15-15-15) would be most suitable, as well as mulching around the plants with well-rotted manure, which will also aid weed suppression. 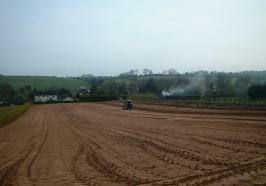 A few granules should be spread around each plant in May, June and July. After the first season's growth, the plants will need cutting back in early Winter or Spring, before they start to grow again. This is to encourage the growth of multiple stems. 1 season's growth from a newly planted sett, which will need cutting back to encourage multiple new growth. 1 years regrowth from 5-6 year old established stool. Wood for logging needs to be seasoned for at least 12 months, the basic rule is to avoid leaving it on the ground, where it will deteriorate. It could be stacked in a cord, which improves aeration enabling the wood to dry out. If you have storage facilities, the timber can be logged and split straight away and then stacked & stored in an open shed for seasoning. Log pile from 10 trees after 4 years growth. Please be aware that the figures given are only an estimate. As every site and season are different we can only suggest yields that could be achieved on an average site in an average season. Only through your own harvesting will you be able to produce accurate figures to suit your own requirements. If an acre approx. 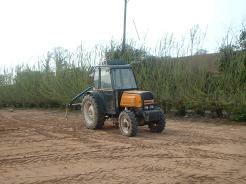 was planted with 2000 setts of 2 or 3 ft long, at 2 metre x 1 metre spacings it should be possible to harvest 1/4 of the area after 4 years for logs, and then harvest a further 1/4 in each successive year. After a further 4 years, the first trees harvested will be ready to harvest again. Once established you could expect to harvest 3 to 8 tons of logs per year. An average home will burn approx. 5 tons of logs per year. 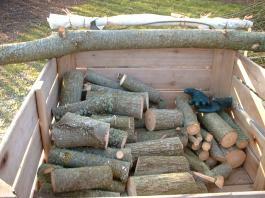 If you were totally dependent on logs as a heat source then you may use 12 to 16 tons of logs per year. Also the tonnes required may vary in colder areas, bigger or smaller houses and the level of efficiency of the insulation. Picture showing the diameter of older stools. The timber shown in this box is from 2 older (8-10 years) stools and the timber from 3 further stools of the same age would fill it.